The LG 29LN4510 LED TV is about as basic as it is going to get. 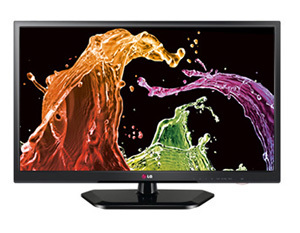 The 29 inch version is the largest in the 4500 series and goes very light on the features. The difference between these models and the 5300 series is the 720p resolution and one less HDMI input. This TV is not meant to be the center piece for a home theater, so sacrifices have been made. 720p content still looks great, especially in the smaller screen sizes. Price is the best part about this one at less than $300. A 29” TV is great for smaller living rooms or as a bedroom TV. The 4500 series has two different model numbers. The 4500 and the 4510. Both are the same with the 24 and 29 inch sizes assigned 4510 while the 22 and 26 sizes are marked with 4500. The direct LED backlighting on the 29LN4510 is a little different from the edge-lit variety. First of all, it deepens the cabinet by an inch or two so the LEDs can fit behind the screen. This style of backlighting is very bright and produces a brilliant image. That's one of the biggest pros. The direct LED lighting also creates bright colors and strong contrast for a budget television. Granted, the picture seen here is nowhere near the mid and top tier TVs from LG. It is supposed to create better screen uniformity as well. From what we've seen this year, it's only going to be better by a small amount if at all. Even as a budget television, the 29LN4510 has a few connectivity options for playing back content from other sources. The single USB port is located on the side of the TV and accepts a variety of formats. They are: DivX HD, JPEG, JPG, MPO, AC3 (Dolby Digital), EAC3, HAAC, AAC, MPEG, MP3, PCM, DTS. That leaves a lot of choice for those that have a library of digital media. Value is the bread and butter of the LN4510. As a budget TV, this one aims at being affordable for just about anyone who is looking for a good deal on an HDTV. The only concern here is some 32 inch TVs are offered for only a little bit more. The size concern may be the driving factor in purchasing a 29 inch TV. Overall, the price is good for the combination of a light feature set, strong picture quality, and basic appearance. Samsung's UN29F4000 is a direct competitor with a similar feature set and price point. The Toshiba 29L1350U is another in the budget category. TV without stand (W x H x D) - 26.3" x 16.2" x 3.2"
TV with stand - 26.3" x 18.0" x 7.2"